Brian Campbell delivered an informative presentation of the California State Military Reserve(CSMR). Campbell has a diverse background that includes governmental, military, and business experience. Campbell has served in the Army, both in active duty and as a reserve, where he held the rank of Major. 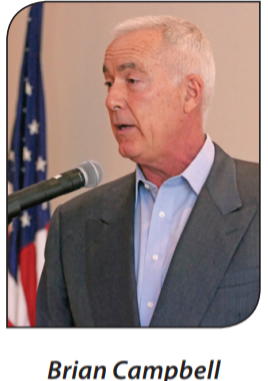 He is also a former Mayor and City Council Member of Rancho Palos Verdes. His business background includes commercial real estate, having owned a brokerage firm with dealings throughout the U.S. and Central and South America. As a Major in the CSMR, Campbell leads the Los Alamitos Joint Forces Training Base (JFTB), which numbers about two hundred soldiers. This unit is not trained as a primary offensive unit. Instead, it receives part of its training in defensive protection of other soldiers and first responders, materials and weapons, command post structures, and related property and equipment. CSMR is called on to support the California National Guard in times of state emergencies and disasters, such as wildfires, mudslides, flooding, and earthquakes. Currently, Campbell is planning broaden the scope of CSMR’s training with the California National Guard to include Africa. In addition, Campbell, as Trustee for the Palos Verdes Library, has traveled to East Africa and Afghanistan, to explore an information exchange. He is working with officials and educators in Uganda and Afghanistan to develop a library exchange system.